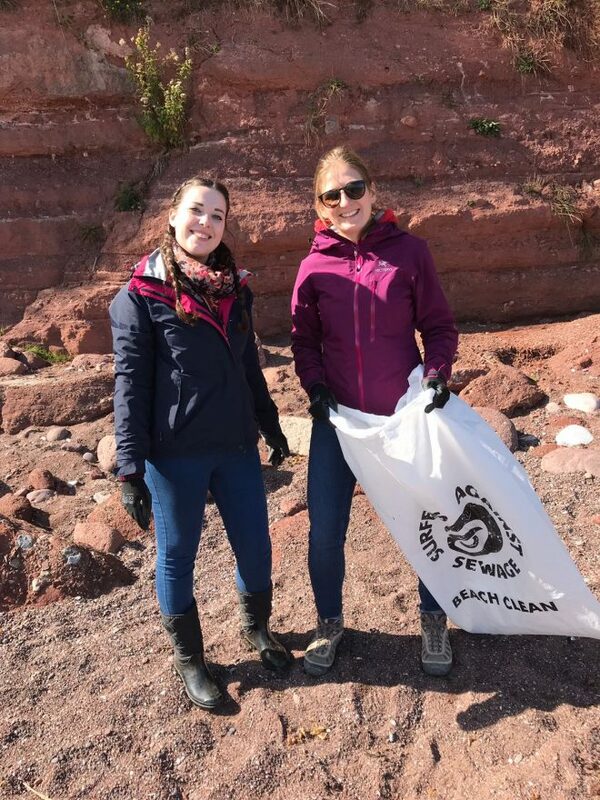 Marine conservation charity Surfers Against Sewage has been chosen by the Met Office as its official partner charity f or the next three years, and the pair-up started with a ‘big clean’ on Ness Cove beach, near Teignmouth. A team of 27 volunteers from the Met Office collected eight large bags of rubbish in one afternoon. The Met Office chooses a new official charity to support every three years. Hundreds of staff members voted, and Surfers Against Sewage – based like the Met Office in the South West – was selected. Recent campaign successes for Surfers Against Sewage include the introduction of the charge for single-use plastic bags, the achievement of Plastic Free Parliament and the Government’s commitment to introduce a Deposit Return Scheme to capture plastic bottles and cans. The Met Office beach clean is part of the biggest Autumn Beach and River Clean ever, that will see over 400 beach and 60 river cleans taking place across the UK through September and October. Andy Yeatman, Deputy Head of Communications at the Met Office said: “We’re really pleased to announce this partnership with Surfers Against Sewage, particularly because it’s a charity that has close ties to us here in the South West. In December 2018, Met Office scientist Kate Salmon will row across the Atlantic Ocean alongside three other crewmates to raise money for Surfers Against Sewage and their ocean plastics campaign. 9 million tonnes of plastic ends up in the ocean each year and nearly 700 species, including endangered ones, are known to have been affected by it. A recent Surfers Against Sewage survey found that 27% of plastic collected was ‘avoidable’ or single-use plastic such as bottles and food packaging. Surfers Against Sewage are currently calling for volunteers for the Autumn Beach and River Clean (20-28 October), with the aim of mobilising 15,000 volunteers from coastal and inland communities to help clean 400 beaches and 60 rivers.